So I need some advice, I’ve owned several hermits and after a molt they all seem to pass away. This is the first crab I’ve owned that molted on the surface and she successfully molted her molt was next to her and she was tucked away in her shell. I moved her into an isolation tank. The next day she was half hanging out of her shell and she’s, I couldn’t see any movement or twitching except a small pulsating in the center of her back. I’m really bothered because this isn’t the first time I’ve had them pass on me after a molt. I’ve had her around seven, eight months and she’s always been very active and enjoys being held, she’s a little bit bigger than a quarter. She ate good and spent a good amount of time in the water dishes. All the food I feed her is organic and fresh. I copied the forum I saw posted in previous articles so if anyone can shed some light I’d greatly appreciate it. A. ZooMed Reptisoil, it’s a special blend of peat moss, soil, sand, and carbon. It’s about 3 inches deep. A. Yes I have a duel ZooMed hermit crab thermometer and humidity gauge that is suction cupped to the back of the tank in the middle from top to bottom and side to side. The temp is always in the yellow but the humidity fluctuates so I have a medium size humidifier that I turn on and off through the day to keep the humidity level up. A. I have a heat lamp that I rarely use it’s only needed with it happens to get cold, which is a rarity because I live in Phoenix AZ. The temp is pretty consistent between 75 and 80*F.
A. I use Arrowhead drinking water for her fresh water and ZooMed premixed salt water. A. I give her fresh coconut, carrots, blueberries, bell peppers, etc., also TREX fruit and flowers mixed with a little bit of calcium powder. A. I’ve had her around seven or eight months she is an Ecuadorian hermit, I got her from PetSmart. A. No, this is her first molt it’s was about two days ago. A. She’s in a ten gallon tank with a rock house and a round log for climbing with 6 fresh air plants in there, it’s also just a wire mesh top but I have half of it wrapped with plastic wrap to keep the humidity in. A. Her and one little purple pincher, he’s smaller that she is and she’s the size of a quarter. A. Seven extra shells all different sizes. A. None they’re in an office with our other array of animals. A. Once a month or every other month, I throw out all of the old substrate and wash the tank with hot water and fresh lemon and let it it completely dry before putting new substrate in. A. I do not use sponges, they dry out the water too quickly and I feel like they can not be safely cleaned so they’re constantly being replaced. A. No nothing at all. A. She’s always been very active even all the way up to the day before she started molting, she gets regular soaks and is climbing on everything all the time she’s by far the best and most active crab I’ve ever owned. A. At this point I don’t know if she’s still alive, she been half out of her shell for the last 24 hours the small pulsating on her back has stopped she’s just laying there limp. Sand from the pet store is not recommended. This forum recommends a 5:1 ratio of children’s play sand and EE. Since you have an Ecuadorian, people here that have E’s will tell you they need about 10” of sub because they’re such avid diggers. Actually dual gauges from the pet store are also not recommended as they’re believed to be inaccurate. Digital ones are recommended and considered better. Hermit crabs need a temperature and humidity range of 80/80. Heat lamps will dry out your substrate.You want a UTH to stick on the back of your tank, not under. The reason for this is that hermit crabs burrow when they need to molt and the concern is that because they also tunnel, they could end up on top of the heater and it could overheat your molter. It also makes it a fire hazard for the amount of substrate hermit crabs need to safely molt. Sticking it on the side is safer and it heats the air to make humid enough to help them breathe. You still need to treat that brand with a product called Prime, a lot of crabbers are concerned that companies like Arrowhead are still adding Chlorine and other heavy metals to make the water taste better. So it is recommended to treat all water, bottled or otherwise. Continue giving the fresh coconut, carrots, blueberries and bell peppers. Ditch the commercial food. It has stuff in it that has killed crabs, so it too is not recommended. Be sure to add in protein and calcium. They need that every day. You did not mention how deep your substrate is. I’m assuming it’s not at the recommended depth, otherwise your crab wouldn’t have molted on the surface. 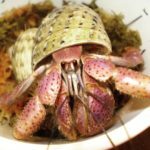 Hermit crabs need a substrate depth between 6-10 inches, or as tall as your biggest crab, whichever is deeper. A 10 gallon will work. The whole top needs to be sealed. You need more shells. Make sure you avoid painted shells. There are the right and wrong shells to buy. Because your molter is an E, E’s like shells with D shaped openings and modified. But be prepared for an E to stick with the same shell and never change shells. People here will tell you you don’t need to change the substrate unless you have a flood, bacterial bloom or you have the wrong substrate because you were listening to the pet store’s advice. Good job on ditching the sponges. They’re considered unnecessary and are believed to harbor bacteria. Please quit bathing your crabs. They can bathe themselves. Thank you for your advice, she has about 3 inches of substrate which is higher than she is, And it’s not the pet store sand it’s a soil but I’m going to get the children’s sand from Home Depot. Unless you have a better suggestion where to get the correct sand I need. Home Depot or Lowes is where you get the sand. And it needs to be mixed with dechlorinated fresh or dechl saltwater to sandcastle consistancy. It has to hold its shape. And as stated, E's need 10 inches, so you will probably need a larger tank. You can find good deals on craigslist, or the apps OfferUp and LetGo. They also need pools, instead of water dishes, deep enough for them to fully submerge. Most use doubled up tupperware containers, with a safe way to climb in and out. I am so sorry this happened! All you can do is wait at this point. Hopefully she is strong enough to pull through. Once they molt it is just a waiting game as anything we do can hurt them more. The reptisoil is safe, it's just super expensive. I agree it's a little shallow for an E as they are usually massive diggers, so at least double what you have now would be much better. Es prefer it warmer and wetter, so 80-85 degrees and 80% humidity. The gauges you have may be wrong and should be calibrated. The thermometer can be compared to another one, and there are instructions on how to check humidity using sale in oue guides section. Any gauge can be wrong, and many new ones are! Cooler temps can be hard on them. Zoomed pre-mixed won't have the types of salt they need. It'll be a few elements at most, while real seawater has over 80. A product for marine fish like Instant Ocean replicates ocean water. Protein is a major major one, especially for Es. These guys are known for attacking and eating other crabs if their diet needs aren't being met! There is no substitution for meat based proteins, and they can eat meat, poultry, seafood and insects. No need to toss the substrate! It's an added expense and it can disrupt their molting cycle as they get used to the changes each time. Spot clean as needed, but these guys don't really make a mess and don't smell much. (It's mostly leftovers that will).